Smoldering remediation is a thermal technology for treating non-aqueous phase liquids (NAPLs) where air is forced through the material to be treated to propagate a low-temperature, flameless form of combustion. The self-sustaining reaction travels from an ignition location through NAPL-contaminated soil, destroying most of the NAPL, while a small fraction is recovered as vapors and treated. The technology can be used to treat a wide range of NAPLs, including coal tar, crude oil sludge, and other difficult-to-treat materials. This approach can be used for ex situ treatment of excavated soils and sludges, and in situ above and below the water table. However, smoldering is not appropriate for remediating materials with low air permeability (e.g., clay or fractured rock) and requires a minimum amount of NAPL to propagate a self-sustaining reaction. Remediation by smoldering combustion has rapidly evolved from a new idea in 2009 to a technology being commercially applied to contaminated soils both in situ and ex situ. It is appropriate for soils contaminated with both light non-aqueous phase liquids (LNAPLs) and dense non-aqueous phase liquids (DNAPLs). Since the smoldering reaction is self-sustaining, very little external energy is required to achieve clean up. Contaminant concentrations are often reduced to below detection because smoldering continues until no NAPL remains. Over 98% of the NAPL removed is typically destroyed in situ, with < 2% released as emissions that require capture. There is no upper limit on the NAPL concentration, meaning the process is attractive as a mass reduction technology for highly contaminated sites. When concentrations are below a certain level (typically ~ 3,000 mg/kg, but very soil and contaminant dependent), the process is not self-sustaining. Smoldering is relatively quick, with in situ propagation rates for the reaction on the order of 0.5 m/day. In situ smoldering works equally well above and below the water table. Field applications of the approach use standard air injection and vapour capture/treatment equipment, combined with special systems to initiate the reaction. Treatability studies and field pilot tests have shown smoldering remediation to be successful in a wide range of soil types from gravel-based fill to silt. However, since it depends on air injection to support the reaction, very low permeability materials such as clay are not appropriate. Ex situ, smoldering can be used for both contaminated soils and for organic wastes. Figure 1. Smoldering charcoal example of a flameless, self-sustaining combustion reaction. It is activated by raising the fuel (i.e., the carbon compounds, in this case the contaminant) to its ignition temperature and ensuring the presence of oxygen. Smoldering is a flameless type of combustion. The reaction occurs within the surface of the fuel. 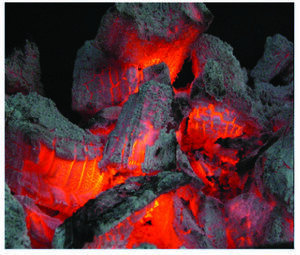 Glowing red charcoal in a barbeque is a typical example (Fig. 1). Smoldering requires a porous fuel, such as charcoal, or an inert porous matrix embedded with fuel, such as sand containing NAPL. This is because the reaction requires air to flow to, and then diffuse into, the fuel surface. After a small, local addition of energy to achieve ignition, the reaction will continue indefinitely as long as air and carbon compounds are available, since the reaction itself produces the energy required to initiate further reactions. For this reason, smoldering is ‘self-sustaining’. This means that the energy generated is more than the energy used to heat the fuel and lost externally. The smoldering remediation concept for NAPL-contaminated soil is straightforward (Fig. 2). Heat and air are applied to a small portion of the contaminated soil until ignition temperatures (specific to the NAPL type, but typically ~200°C) are reached, after which the smoldering reaction initiates. At this time, the heater is no longer needed and is turned off. Air injection continues and the burning NAPL is converted primarily to CO2, H2O, and also heat; the latter is absorbed by the adjacent soil and NAPL, thereby allowing the process to continue. The reaction, propagating in the direction of the air flow, will continue as long as the pathway contains NAPL or until the air flow rate (i.e., O2 mass flux) falls below a critical amount required to support the reaction. The smoldering front will propagate through the NAPL-contaminated soil as a relatively thin (few centimeters) reaction zone, with a heated zone preceding it and a cooling, clean zone behind it (e.g., Fig. 2). This can be clearly observed in a webcam video of a self-sustaining smoldering reaction in coal tar-contaminated soil (Fig. 3). In the video, the reaction propagates at ~ 0.5 cm/min such that it takes ~ 15 min to travel from the bottom to the top of the 30 cm quartz column. This propagation rate is linearly dependent on the rate that air is injected. This means that the velocity of the smoldering front (and thus the mass destruction rate) is easily controlled by the operator by manipulating the air injection rate. The reaction zone temperature depends primarily on NAPL type, typically ranging from 500°C (e.g., for diesel) to 1000°C (e.g., for coal tar). Water-filled porosity tends to have little effect, since there is a boiling front that travels ahead of the reaction and air flows from the injection pipe through dry sand to the heated NAPL participating in the reaction. In fact, smoldering remediation below the water table is common. Figure 2. Animation showing the concept of NAPL destruction in soil by self-sustaining smoldering. Figure 3. Webcam video of a self-sustaining smoldering reaction traveling upwards in a 30 cm tall transparent quartz column containing coal tar contaminated soil (accelerated 50 times). Figure 4. 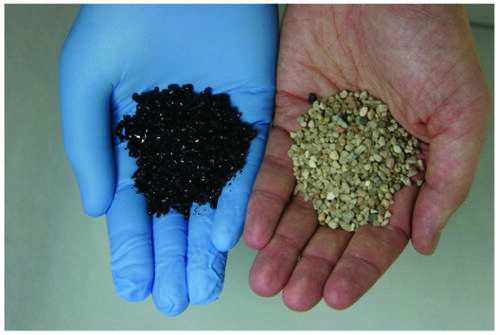 Comparison of coal-tar contaminated soil before and after smoldering treatment in the laboratory. A self-sustaining smoldering reaction terminates on its own when no NAPL remains. After the process is complete, it is typical to observe dry, organic-free soil (Fig. 4). Typical reductions in soil of total petroleum hydrocarbons are > 99.9%. The reaction can be terminated sooner, if desired, by turning off the airflow. NAPL smoldering cannot continue in the absence of forced air injection, therefore a runaway reaction is not possible (unlike underground burning coal). In some cases, the amount of energy generated is not enough to overcome heat losses and the reaction is not self-sustaining. This can occur if not enough NAPL is present; typically ~ 3,000 mg/kg, with the exact value being soil and NAPL dependent. It also can occur when the NAPL is present in too narrow a finger, so that heat losses to the surrounding (clean) soil are severe. Laboratory results suggest that a NAPL finger thicker than ~ 2 cm can be self-sustaining (publication in preparation). Details about the fundamentals of smoldering NAPLs in soil are available. 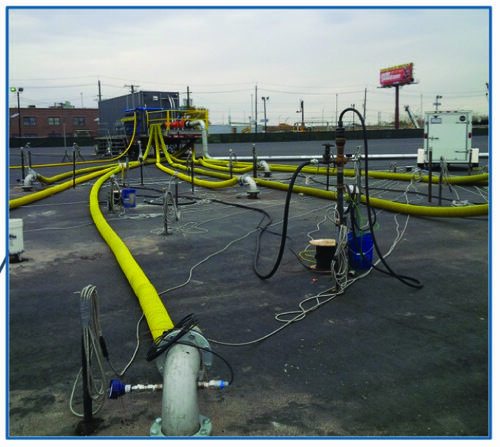 Smoldering remediation is most readily applied to complex, long-chain hydrocarbons such as coal tar, fuel oils, and unrefined or heavy petroleum hydrocarbons. These NAPLs contain significant embedded energy. For example, coal tar has a heat of combustion of ~35,000 kJ/kg, which is more than double that of wood. However, the suitability of a NAPL for smoldering cannot be evaluated by its heat of combustion because other characteristics of the NAPL compounds and the soil play an important role. For instance, compound volatility and the composition of mixed NAPLs are important. Coal tar and heavy hydrocarbons exhibit low volatility in the majority of their hundreds of compounds, making their smoldering reaction highly self-sustaining. This means that their removal during smoldering is dominated by in situ oxidation rather than volatilization. For example, < 2% of coal tar mass treated by smoldering was volatilized with > 98% destroyed in situ. The high suitability of heavy hydrocarbons to smoldering is fortuitous since these NAPLs tend to be the most resistant to standard physical, chemical, thermal, and biological treatments. More volatile NAPLs, or the more volatile components of mixed NAPLs, can exhibit higher mass fractions volatilized due to the heating front that moves ahead of the smoldering reaction. If a NAPL is too volatile, such as gasoline, it may be difficult to ignite. Diesel has been demonstrated to be treated with self-sustained smoldering in some circumstances on both laboratory and field pilot tests (publication in preparation); this is likely among the most volatile NAPL compounds that can be directly smoldered. Lighter compounds, such as gasoline and chlorinated solvents, tend to be too volatile to be smoldered directly. In these cases, neat or emulsified vegetable oil can be injected into the soil as a non-toxic fuel to support smoldering. This has been demonstrated for trichloroethylene (TCE) in laboratory studies, producing soil that had no detectable chlorinated solvents (or vegetable oil) remaining. That work demonstrated that, of the chlorinated solvent mass removed from the soil during smoldering, ~ 25% was destroyed in situ and ~ 75% was volatilized and captured in the emissions. A similar ratio of destroyed to volatilized mass was observed in a recent field pilot test for emulsified vegetable oil (EVO) smoldering to remediate gasoline (publication in preparation). In such cases, EVO smoldering may be an inexpensive means to accomplish thermal treatment, the goal of which is to volatilize most of the contaminant for recovery and treatment at the surface. Other gaseous compounds can be produced in minor quantities that require careful attention to capture and treatment. Carbon monoxide is typically produced as a byproduct of smoldering. Although it is typically a fraction of the amount of carbon dioxide (i.e., most combustion is complete, not incomplete), it is a regulated compound that must be carefully monitored, captured, and handled. Incineration of chlorinated compounds and vegetable oil may, under certain conditions, produce gaseous byproducts including volatile organic compounds, phosgene, and dioxins/furans. Laboratory studies of smoldering TCE NAPL found perchlorethylene (PCE) generated at concentrations two orders of magnitude less than TCE emissions, and phosgene concentrations an order of magnitude less than regulatory limits. The same study found that aliphatic hydrocarbons in trace amounts were observed due to smoldering the injected vegetable oil. Dioxin/furan formation is complex and highly dependent on the type and mass fraction of chlorinated compounds in the NAPL, the smoldering temperature, the smoldering rate, and numerous other factors. The potential for its formation should be evaluated on a site-specific basis using laboratory treatability studies and confirmed with an on-site pilot test. In all cases where minor gaseous compounds of concern are expected, standard surface vapors treatment techniques are implemented (e.g., adsorption on activated carbon, regenerative thermal oxidation). Bench scale treatability studies are the best way to evaluate whether a particular contaminated soil or liquid waste is a good candidate for smoldering remediation. Standard laboratory tests can determine whether the contaminated soil sample is self-sustaining alone or self-sustaining with the addition of EVO. In the case of liquid waste, a homogeneous mixture with sand is typically created first. The treatability study can provide the peak smoldering temperature, the expected smoldering front velocity (linked to estimates of mass destruction rates), and before/after contaminant concentrations. Specialized treatability studies can also examine site-specific questions, including the fraction destroyed versus volatilized, the amount of CO that might be generated due to incomplete combustion, the fate of metals, or the potential for dioxins and furans to be formed (e.g., with chlorinated compounds). A treatability study can reveal if the soil permeability is too low to permit sufficient air flow to sustain the reaction. Smoldering reactions at the bench scale are less robust (due to higher heat losses) than at the field scale and bench treatability studies are usually conservative (i.e., if it smolders in the lab, it is very likely to smolder in the field, and may do so at lower contaminant concentrations and/or with lower air flow rates). Current research is pushing the boundaries of the material types that can be remediated with smoldering. Wastes that are typically considered too wet to be combusted in a conventional manner have been shown to be amenable to smoldering due to its high-energy efficiency. A recent study demonstrated that smoldering is a promising alternative for converting wastewater treatment plant biosolids into heat and inorganic ash. Faeces mixed with sand can be smoldered, potentially offering a low-energy sanitation solution for the developing world. Smoldering has been demonstrated as a successful in situ technology in several pilot tests. The equipment and typical pilot test stages are animated (Fig. 5). As an example, in situ smoldering was applied to a coal tar layer present at 8 m depth in an alluvial aquifer, 7.5 m below the watertable. Ignition was achieved after ~ 3 hours of heating a region immediately around the well-screen. Thereafter, the self-sustaining reaction travelled outwards over the following 11 days in an approximately uniform manner in all four compass directions, reaching a radius of influence (ROI) of ~ 3.5 m. During that time, coal tar destruction rates were measured at ~ 80 kg/day, as determined from combustion gases collected at the surface. An estimated total of 860 kg was destroyed, with < 2% recovered as organic compounds by the vapor collection system. Total petroleum hydrocarbon (TPH) concentrations were reduced from a pre-treatment average of 18,500 mg/kg to a post-treatment average of 450 mg/kg, based on soil core sampling (Fig. 6). The fact that the zone being treated was below the watertable was no barrier to in situ smoldering. The test also demonstrated that the smoldering reaction rapidly terminates when air injection is stopped. 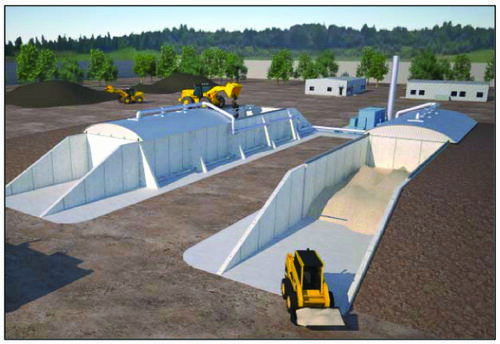 The pilot test results were used to design the full scale site remediation (Fig. 7). Note that heterogeneity of in situ permeability, which dictates the spatial distribution of air flow, can affect the distribution of smoldering propagation rates. Further details about smoldering pilot tests, full scale applications, and challenges associated with in situ application are described elsewhere. Figure 5. Animation of the stages of an in situ smoldering remediation treatment below the water table including typical equipment employed. Figure 6. Soil cores from before and after an in situ smoldering remediation pilot test at a coal tar contaminated site. Figure 7. Photograph of smoldering remediation full scale site treatment at a former chemical manufacturing facility in the USA. "Ex situ" treatment with smoldering is relatively straightforward because issues associated with heterogeneity, air flow distribution, and vapor management are more easily controlled and optimized. The smoldered material can either be (i) excavated contaminated soils, or (ii) organic liquids from lagoons or industrial processes that are mixed intentionally with sand. In the latter case, the sand matrix can be reused in subsequent batches, since treatment renders it clean and relatively unaltered. When ex situ treatment was scaled-up from a bench column to an oil drum to a pilot field system, the technology was shown to be equally or more effective at larger scales. Pre-test concentrations averaging 31,000 mg/kg TPH were reduced to 10 mg/kg (Fig. 8). An example design of an ex situ smoldering treatment system is rather simple to illustrate (Fig. 9). Large scale treatment systems have been designed to treat approximately 100,000 kg of sludge or 500 m3 of contaminated soil per day in a semi-continuous manner. Figure 8. Pilot test of ex situ STAR treatment for coal tar liquid waste intentionally mixed with coarse sand. Figure 9. Illustration of one design for an ex situ smoldering system. Smoldering remediation is typically used as a source treatment technology where the goal is NAPL destruction to the extent practicable. Mass destruction rates on the order of hundreds of kilograms per day per ignition point are typical, with propagation rates on the order of feet per day. Typical sites amenable to in situ smoldering remediation are those impacted by low-volatility recalcitrant compounds such as coal tar, creosote, or petroleum hydrocarbons at soil concentrations equal to or greater than approximately 3,000 mg/kg TPH within silty sand or coarser geologic units. This concentration is required to maintain self-sustaining smoldering (i.e., combustion without the input of external energy). The ability for smoldering to propagate outwards from a local, small energy input (e.g., few hours application at an ignition point) in a self-sustaining manner for many days in all directions where contamination exists, represents a major advantage in terms of cost savings, carbon footprint, and life cycle assessment. The suitability of a soil/NAPL site for smoldering treatment is easily determined with a laboratory treatability study. The radius of influence for a single ignition well is a key design parameter that is best determined by a field pilot test. The smoldering remediation process can tolerate some site heterogeneity. For example, pockets exhibiting soil concentrations below the required minimum will be treated. In addition, the self-sustaining process can tolerate “clean gaps” in the contaminant distribution, transferring accumulated heat and starting combustion on the far side of the gap. Clay lenses can be tolerated, and will even be treated (pyrolized) as the treatment front passes by, but the overall unit to be treated requires adequate permeability for air injection to support the smoldering reaction. The rate of air injection provides a control on the mass destruction rate, and is accomplished with standard air injection equipment (e.g., compressor). Depth below the watertable is an important design consideration, but does not impact the suitability of the smoldering remediation process (i.e., smoldering can be applied both above and below the watertable). Intermediate volatility contaminants, such as diesel, can often be smoldered directly. However, highly volatile NAPLs including gasoline and chlorinated solvents require a supplemental, non-toxic fuel such as EVO to be injected to support smoldering. In these cases, standard EVO injection equipment can be used and smoldering should be considered as a potentially inexpensive means to achieve treatment by heat-induced volatilization and surface capture/treatment. In any case where emissions of concern may be generated, standard vapor extraction and treatment systems are implemented. Smoldering remediation results in the near complete destruction of organic compounds wherever combustion occurs. Concentration reductions > 99% are common in treated areas and post-treatment concentrations above non-detect or near non-detect levels are typically only associated with small areas where combustion did not occur within the target treatment zone. It is expected that, after smoldering remediation applications, groundwater contaminant mass flux may be reduced to a point that it can be addressed through monitored natural attenuation (MNA). Smoldering remediation can also be applied ex situ. The same types of impacted soils and contaminants apply as for in situ treatment, with the added benefit that materials can easily be manipulated to optimize the application. For example, the blending of highly contaminated soils with lightly contaminated soils can be carried out to create a mixture ideal for smoldering treatment. In addition, sand can be added to increase the permeability of material, thereby increasing the range of soil types suitable for the process. In addition to soil treatment, ex situ smoldering remediation systems can be used as a waste disposal technology for liquid organic wastes. In such cases, sand is mixed with the waste and the treated sand is then recycled for subsequent batches.